In 1896, the Light House Board requested $25,000 from Congress to build Cedar Point lighthouse on the southern side at the mouth of the Patuxent River to mark a dangerous sand bar. Cedar Point sat on 1.54 acres with a three-story brick and cedar-shingle house crowned by a 50-foot tower housing lens and fog bell tower, oil house, boathouse, outhouse and bam. The Cedar Point Light was of the fourth order Fresnel lens variety. The Cedar Point Light is recorded as having flashed every five seconds and having been visible for seven miles. Photograph at right of Cedar Point Lighthouse (1981) - View North, Southwest (front) and southeast elevations from Southern Maryland Online. The lighthouse building was 33 feet in length and 27 feet in width with the peak of the roof rising 43 feet above ground. The lantern above the wooden tower was 50 feet above ground level. The first story was of brick while the second story was shingled up to the line of the tops of the windows. Cedar Point quickly eroded, hastened by local sand dredging. 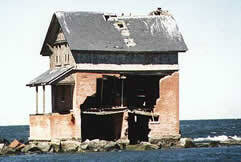 When the lighthouse was abandoned in 1928, by the Coast Guard, it stood on an island. 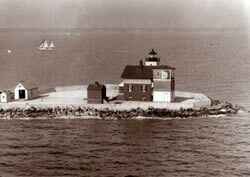 The Navy purchased the lighthouse and remaining land from the Coast Guard and Arundel Corporation in 1958. They worked with historical groups to give the lighthouse a home. Unfortunately, Cedar Point lighthouse was too decrepit to save. In 1981, the bell was removed to the entrance to the Patuxent Naval Air Station. The cupola from Cedar Point is preserved in Lexington Park, MD, at the Naval Air Test and Evaluation Museum , and the sunburst pattern of wood slats, from under the eaves of the roofline, is at Calvert Marine Museum in Solomons, MD. The rest of the lighthouse was torn down in the late 1990s.